Hip hop Shakespeare? Free Shakespeare in the Parks? Shakespeare for kids? Shakespeare with bold theatricality? Thanks to the Chicago Shakespeare Theater(CST) the Bard&apos;s words connect to our lives today. Because for the creative, award-winning CST team, the question is definitely "how can we help Shakespeare speak to us today?" instead of just "to be or not to be?" Inf act, "Shakespeare speaks to everyone" is the motto of the Chicago Shakespeare Theater at Navy Pier. The city&apos;s global theatrical force is known for vibrant productions that reflect Shakespeare&apos;s genius for storytelling, language and empathy for the human condition. If that sounds like a tall order, you don&apos;t know Chicago. 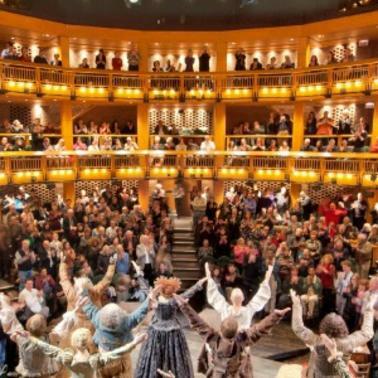 Here are some of the words that describe the Chicago Shakespeare Theater. New. In the fall of 2017, the CST will add a third stage to its Navy Pier campus, creating one of the city&apos;s most cutting-edge cultural destinations right on the lake. An all-weather venue, The Yard is a $35 million engineering marvel of stage design consisting of three mobile towers that can be configured into various performance areas, depending on the vision of each designer and director. Approachable. Have a beer, tea or glass of wine at the cozy CST lounge and you may just come across the actors relaxing before or after the play. If that&apos;s not enough, check out the theater&apos;s free audience enrichment programs, when the actors and directors explain their work and concepts and take questions from the audience. Easy. Experiencing one of Chicago&apos;s most beloved cultural institutions is easy, too, because CST ticket holders receive discounted parking at Navy Pier. And even if the lots are full, just tell the attendant you&apos;re "here for Shakespeare" and they will wave you through to a special CST parking area. How&apos;s that for feeling like a VIP? Navy Pier is also well served by Chicago public transit as well as the trusty Navy Pier Trolleys. Plus, indulge in pre or post theater dining at one of the many Navy Pier restaurants; some of which offer discounts with your CST ticket. Theatrical. Despite a mind-bendingly innovative take on Shakespeare and how his words relate to today&apos;s world, the CST is firmly rooted in the legacy of Shakespeare as a theatrical innovator. The unforgettable productions are the heart of CST&apos;s mission. Epic plays, musical productions, and magical family-friendly performances each season make the CST one of the city&apos;s most enticing destinations. Fun. For all ages! Get this: Anyone under age 35 can buy up to two $20 tickets per production. At that rate, you can treat mom! From classic to contemporary, sword play to hip hop, you&apos;ve got to see "Chicago Shakes" to believe it.